Save on your electrical bill with the Waterproof Automatic Solar LED Lamp, with its super bright light, it provides high brightness with the built-in LEDs to illuminate your porch, backyard, front door, balcony, lawn, garden. Easy to install, just plug and use. Save money from your electric bills. Get Your Waterproof Automatic Solar LED Lamp. Order It Here! This Rechargeable Solar Light LED Lamp is great for power outdoor lights and works efficiently with the solar panel to absorbs heat from the sunlight. It generates solar power for the light, with as much as 30% solar transfer rate for faster charging. The Built-in rechargeable LFP battery allows long time use. Switch to this Waterproof Automatic Solar LED Lamp for a cost-efficient alternative to your home’s lighting! A perfect start when transitioning to solar-powered electricity, this automatic solar LED lamp is surely energy saving! In the forefront of solar lighting, it can run up to 24 hours when fully charged. With a screwdriver, you can easily install it indoors or outdoors. The 16ft cable allows you to put the solar panel under direct sunlight. The day and night sensor specifically makes it automatically respond to the darkness and brightness of the environment. 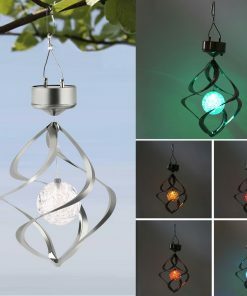 Designed for multipurpose lighting, its brightness is adjustable. Compared to electronic powered lamps, this is cheap and low maintenance. When the solar panel absorbs the heat of the sunlight, it gets stored into the 2000mAh Li-ion battery. It may take 10-12 hrs of solar energy to fully charge. The LED porch light has a one-piece backside design, with alloy material so it distributes the back heatsink quick and be able to dissipate the absorbed heat. Connect the solar panel light with the cord if you want to install the solar panel on the ground, balcony, roof, second floor wall, or an area with more sunshine. The wall mounting bracket can even be adjusted towards the direction of the sunlight. Its wide illumination allows the LED per side provides brightness in a wide angle design. If your hesitant to get this, wondering if there’s a need for special wiring knowledge, there’s no complex electricals needed, it’s a plug and install solar lamp. Gather and store energy when the sun is up. Order Your Waterproof Automatic Solar LED Lamp. Get It Here! These lights were good, I ordered three lamps. Good enough and its money saver since the lamps are excluded from my power bills. The 24 hour lighting is awesome! I like it, illuminates my patio infront and the garage. I’ll get two more to light the other side and back.